Singularly highlights landscape architectural elements with clear design principles! 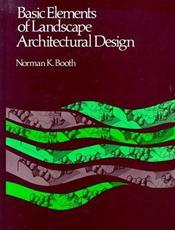 Designed to be used as a helpful resource by individuals beginning their careers, Basic Elements of Landscape Architectural Design presents the thoughts and key design theories fundamental to landscape architecture in simple words and illustrations. Still available from Waveland Press, this highly regarded sourcebook offers the vocabulary, significance, characteristics, potential uses, and design guidelines for landform, plant materials, buildings, pavement, site structures, and water in landscape architectural design. It will help your students overcome common mistakes and misconceptions typical in the early phases of their design career and will heighten their understanding and awareness of the major physical components of the outdoor environment.